Here is the actual transom with the lettering on it as found last year. 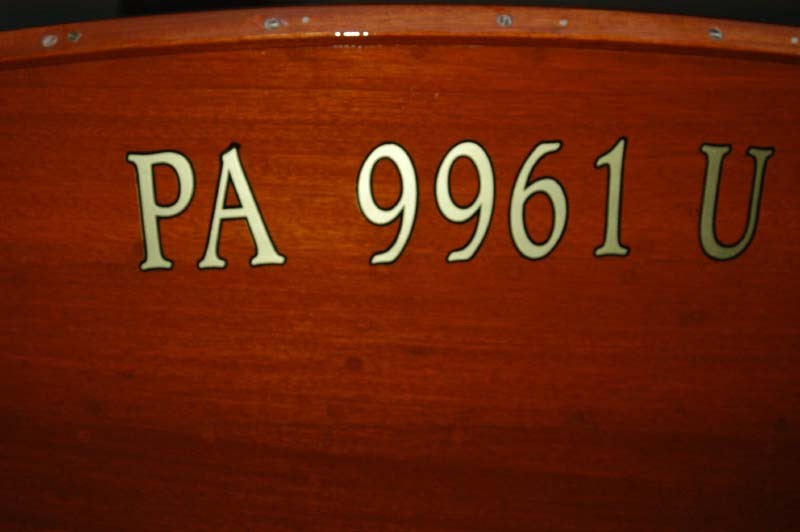 One of the final details of the On Golden Pond Boats is the lettering. And when you do that with a very famous boat. You bring in the best in the country. Alan Johnson. And of course art takes over science. Until Frank “CSI” Miklos gets involved as well. When we brought the boats back to the attention of the world, we were amazed at how original they were. Mariah was a time capsule never being touched after the filming. Frozen in Rotted bottom time. So the lettering on her is relatively easy. So was the thinking on Thayer IV U-22 1460 the main picture boat. I mention main picture boat because as it turns out the movie frame from one scene told a different story than the boat in its found state. Turns out through a keen eye and OCD the gang was able to figure out that at some point after the film, Thayer IV 1460 was re lettered. Here are the images to back up the case.. Your honor.. Lets start with what the transom we found looked like. This is the transom the day we found the boat. Un touched. Note the red lines and thier relationship to the snaps and exhaust. Now, note the red lines on the image from the film. Note, the letters do not line up. AND the type is larger. With the magic of photoshop one can see that just by reducing the type it lines up perfectly to what was on the screen. Snaps are still in place. Insane you think.. oh thats just part of it. One question is, did the angle of the film and distortian of film being shot from a helocopter effect the transom image. .. The snaps dont lie.. Those crazy snaps! Never have some stupid snaps meant so much. But.. To just make sure. The folks at katz’s took a matching angle shot to line up and check.. Did they rent a chopper to do it. I would not put it past them at all. Note the clip from the film at the same angle as the boat. Perfect match. Now on to lettering. The following images are of Alan Johnson doing his thing. Science did its job.. It’s time for the artist to do his magic. MAGIC JOHNSON does lettering! Here is the lettering all laid out by hand. Ready for leaf. Note the lines to make sure it all lines up. The gold leaf goes on. I think Alan was listening to 80's music to make sure he was in the right vibe..
And the lettering and outline are done as of 15 minutes ago. Stay tuned for more lettering as Mariah the US mail boat gets her day in court! Love Wood Boats? Love Classic Cars? Get Out Your Drool Cup. The Woody Stuff Store Is Open! Pull the tape!! I want to see the boot stripe in that shot! Get out your dollar bills! Love the real goldeaf! Amazing! Would be great fun to be a little mouse on Alan’s shoulder & watch the process of a true master. Mariah next? Mariah is being dulled down as per the film. So the lettering will happen on Wednesday. I love the detail in the lettering. I would also like to acknoweldge the detail work that someone prefromed on the inside of Mariah. First the repair of the ribs. Second the person or persons who painstakingly cleaned and sanded all those laps and ribs from the original boat. Having done the inside of three lymans, 52 feet in total, I have total respect for the labor and care to refurbish all the limber holes and the surrounding wood work and not have it be a hack job. You have lapstrake Cred. Got to say boys and girls, this whole subject “dulls me down”….but I never even saw the flick…..I guess I must have GONE BOATING!! Cool provenance and great resto work. Should be real head turners in Tavares! We are all infected with boat-tritus to varying degrees. WHAT DOES THE REAL GOLD LEAF COST FOR A NAME THAT SIZE? IS “ENGINE TURNED” GOLD VINYL LIKE YOU SEE ON FIRE TRUCKS A NO-NO ON VINTAGE BOATS? I UNDERSTAND THE VINYL DOESN’T HOLD UP TO UV LIGHT WELL. DO FOLKS VARNISH OVER THE VINYL TO PROTECT IT? ANY ADVICE OUT THERE ON ACCEPTIBLE BOAT NAME MATERIALS? Frank – Thanks for the info on the “Old School Decals”. I for one didn’t even know anyone was still reproducing them as water transfer decals. I just inquired about this last week for my Chris-Craft project, because I don’t like the step that the vinyl decal leaves behind. Often when we receive a comment that includes a number of links, WordPress asks us to moderate / approve the comment to ensure it’s not spam. Your original comment was approved and is now shown above. Sorry for the delay, we usually catch them right when they are posted, and approve as required. We started making custom decals when we could not find sign painters that were good enough for the job… We now have quite a few types that we make… Several different Century Decals (not always in stock but can make more) then Chris Craft decals were no longer available in water decals so we started making them also Ventnor. and the now custom numbers for registration… Some in stock some not… I also don’t like the step… My brother restored an Oldsmobile and made custom decals for that project. applied under the clear coat no step… pretty cool… We have also done engine decals. Thanks to the crew at Katz’s Marina for all your help getting this job ready for me to add the final touch. I look forward to the finish project. A special thanks to my friend and video wiz Carol Mittelsdorf for the documentary work on this historic restoration.